For years, military live fire exercises have relied on either stationary or pop-out targets but they don't really simulate enemy movements—they just sit there, waiting to be shot. These targets, newly developed for the USMC don't; they move, behave, and react just like real combatants. 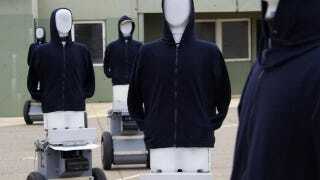 Yes, at first glance the Smart Targets, as they are called, look like mannequins on Segways—because, well, they are. But they are also so much more: autonomous, programmable, and responsive. The same programming processes that control the AI in, say, any of the Splinter Cell series—where enemy guards move along set paths but are still smart enough to investigate the sounds of their comrades being pistol-whipped—controls the movements of these dummies. Using a laptop and a proprietary GUI, the instructor can create and run training scenarios—dictating the dummy's speed, travel pattern, and acceleration and stopping among other variables. The dummies themselves come in two varieties: the two-wheeled T20 and the four-wheeled T40. They both stand 5-foot 11-inches tall and move roughly as fast as people run—7-11 mph. The T20 is built directly on an armored Segway platform. It can turn in tight circles and leans forward when it accelerates, just like a human. When a kill shot is registered, the T20 will drop its dummy and the other T20's in the area—being networked—will all scatter for cover, quickly reacting the changing situation. The T40 is the off-road version. It has four wheels and a stronger motor to help it power over dirt, gravel, grass, and brush. An on-board GPS unit and laser range finder make sure the T40 doesn't go barreling headfirst into trees. Obviously designed for outdoor use and larger caliber shot, the T40 has extra armor plating that can withstand 5.56mm and 7.62mm FMJ rounds. Its hit sensor can differentiate between shots to the head, spine and body. A set of eight of these devices have just been delivered to Quantico in Virginia for live firing exercises. They were developed by the Australian firm Marathon Targets and approved by the US Foreign Comparative Testing (FCT) program, evaluates market-ready technologies that could prove useful to US defense forces. Their cost? $57 million AU.